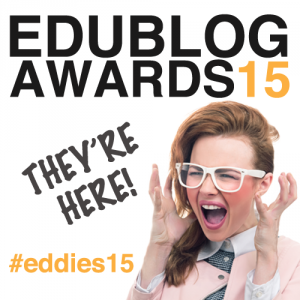 Voting is now closed in the 2015 Edublog Awards! Many congratulations to all the nominees and finalists. Each year there are more and more nominations, and of increasing excellent quality, reflecting the ever growing edublogosphere — which is excellent! But this means that unfortunately we can’t list every single nomination in each category — that’s too overwhelming for everyone. Instead, our intrepid team of judges combed through hundreds of nominated sites to whittle them down to a manageable number of shortlisted finalists for each category. Apologies in advance if your site or nominated sites don’t make it – this was such a tough decision! The system may accept your vote more than once, but only one will be counted! I think that’s it for now. Voting will close at 11:59pm EST on Wednesday, December 16th. (Check in your timezone here.) Now go vote and discover great new blogs, resources, and people to follow!